Tyddyn Llan is well placed to explore the magnificence of Snowdonia and its many castles and monuments. The Roman City of Chester is only 35 miles away, as are the majestic Mawddach and Dyfi estuaries leading to fine sandy beaches and rocky coves. Fishing on the banks of the River Dee. Walking from the hotel, via ancient routes and old driving roads, experience the peace and quiet of this unspoilt landscape. Our local and highly qualified guide is also avalable. Sailing, wind surfing, canoeing and white water rafting. Golf – There are excellent 18 hole courses at Llangollen (15 miles), Chirk and Bala (8 miles). 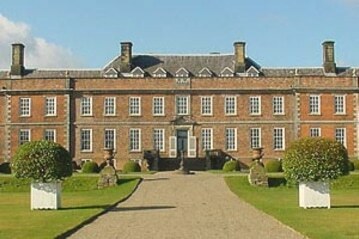 Shooting – We are centrally placed for excellent pheasant shooting and can also arrange clay pigeon shooting. Llangollen is where Wales welcomes the world and is also the festival capital with the Royal Pavilion and its spacious grounds playing host to year-round events, where singers and dancers congregate from every corner of the earth. Apart from being the festival capital of Wales, Llangollen and the Dee Valley has a wealth of attractions and activities to appeal to almost everybody. 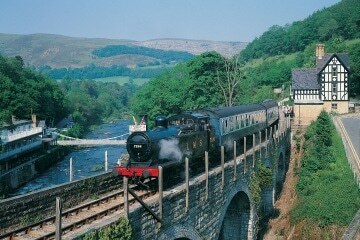 Llangollen is a truly amazing town, encapsulating the best North Wales has to offer in a small area. With more sun than Cornwall and less rain than the Lake District it is no wonder that this gateway to North Wales should be so popular with sightseers and walkers of all ages. Llangollen has many natural wonders. 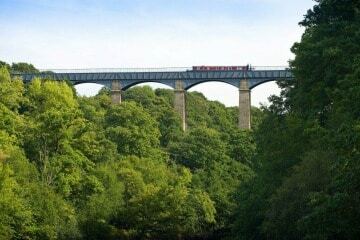 There are mountains, white water rivers including the spectacular River Dee canals with horse-drawn boats, the Llangollen Steam Railway with steam trains that chug along the Dee Valley, the Horseshoe Pass, and the Horseshoe Falls. 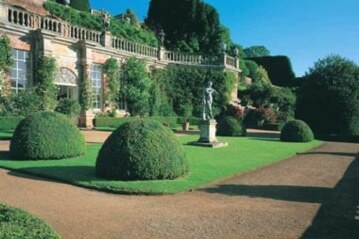 Famous structures, gardens and historic buildings abound, Plas Newydd, home to The Ladies of Llangollen, numerous National Trust properties surround the town and we have the highest and longest aqueduct on the canal system. 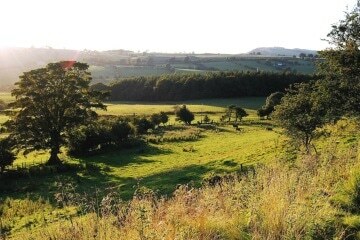 Drive along the Panorama single track road high above Llangollen with amazing views of the Dee valley and extending to the Shropshire and Cheshire plains. Take a packed lunch and walk the hills littered with coral and sea shell fossils confirming this raised mountain was once below sea level. At the end of the single track road go further up the mountain and enjoy a pot of tea and some home-baked cakes at Prospect Tea Rooms. Llangollen also hosts The Gardening Show, International Eisteddfodd, The Motorcycle Show, The Food Festival, and a monthly antiques and collectables fair. 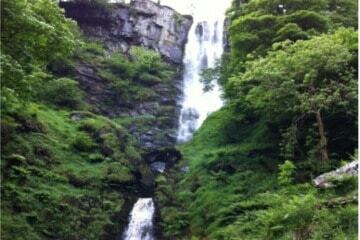 A Welsh wonder not to be missed is Pistyll Rhaeadr. 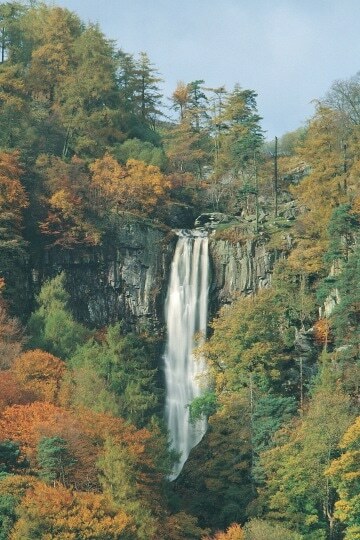 The highest waterfall in Wales, an enchanting waterfall in the Berwyn mountains, is just west of Chirk and a 20 minute drive from Tyddyn Llan. This much loved waterfall is captivating to all who visit her, it’s also a great place to explore the Berwyn Mountains and surrounding hills, with many walks on all levels to suit a variety of walkers. Take your camera and walk up the Berwyn mountains to the Stone Circle. We have leaflets with guided instructions to get you to the top, which takes about one hour. With its location at the top of the mountain “Moel Ty Uchaf” it has stunning panoramic views over the valley below. The circle itself is also very attractive and in a good state of preservation with its 41 stones in a ring with an extra one inside, a mini Stonehenge. It also is a fantastic spot to see the sun set. 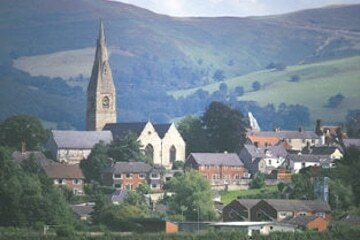 Walk around the historical market town of Ruthin, with its selection of delightful shops, tea houses and restaurants. 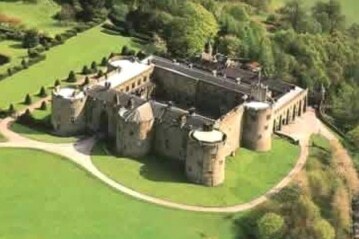 Check the time on the clock tower in St Peter’s Square, enjoy a coffee at the Ruthin Castle hotel which stands in the grounds of the original castle which burnt down back in 1400. Pop your head into the half timbered Nat West Bank which was the old court house built back in 1401 and features the remains of a gibbet last used to execute a Franciscan priest. Visit the Gaol which ceased to operate as a prison back in 1916 and has been extensively renovated and is now open as a museum. 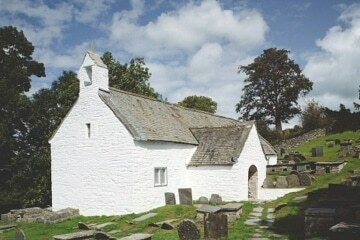 Visit our two most famous delightful religious sites, Rhug Chapel and Llangar Church. Llangar is on the road back to Corwen just after Cynwyd on the left hand side. This small medieval building stands in an idyllic setting overlooking the confluence of the Dee and Alwen rivers. Inside it will take you back to another age with many ancient features including extensive 15th century wall paintings, a 17th century figure of death, old beams, box pews, pulpit and minstrels gallery. At Rhug, situated on the road towards Ruthin just after the traffic lights you will find a rare example of a little-altered private 17th century chapel, the plain exterior gives you a little hint of the riches within, carved angels, an elaborate roof decorated from end to end and as a counterpoint to the exuberance, a ghoulish wall painting of a recumbent skeleton as a reminder of mortality. 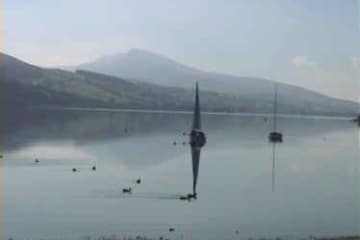 Bala Lake was the largest natural body of water in Wales prior to the level being raised by Thomas Telford to help support the flow of the Ellesmere Canal (it still is the largest natural body of water in Wales). 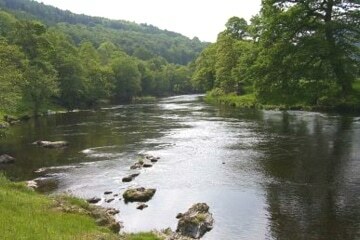 The River Dee runs through it and the waters of the lake are famously deep and clear. The town of Bala sits at its northern end and the narrow gauge Bala Lake Railway runs for several kilometres along the lake’s southern shore. Bala is the centre for the adventurous, activities include sailing, white water rafting, Land Rover 4x4, Quad biking, high ropes and paint balling at the Get Wet centre, or just hire a bicycle and ride around the lake. 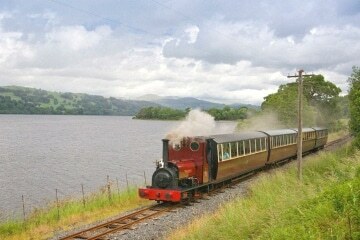 Take a steam train ride from the village of Llanuwchllyn about a 30 minute drive away on the Bala Lake narrow gauge railway along a 9 mile delightful journey with excellent views of the lake and through the surrounding pastoral and wooded scenery of the nearby mountains on the edge of Snowdonia National park. 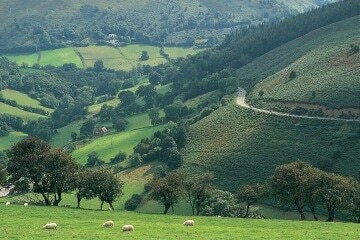 On the way, there are fine views of magnificent Cadair Idris and Talyllyn Lake as you descend. Stop in one of the several parking areas to take in the view. The road skirts the glacial lake that reflects the steep valley and screes of the base of Cadair Idris. The Tyn y Cornel Hotel can organise fishing on the lake and boat hire. It’s renowned for excellent wild brown trout and salmon are also taken on the fly. Aberdovey Golf Course is a beautiful links course set amongst the dunes, and fairly easy walking, but some testing holes. Enjoy a walk in the town and see the harbour and many boutique shops. Return via Machynlleth, the ancient Capital of Wales where Owain Glyndwr held his Parliament in 1180. There are numerous independent shops and galleries in the high street, and it’s worth a stop for half an hour. Wednesday is market day and the high street bustles with people and numerous stalls selling everything from seafood, vegetables, meat to clothes and bric-a-brac. 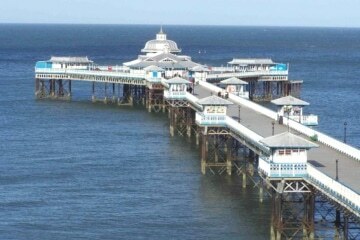 The Victorian seaside resort Llandudno is just a one hour drive from the hotel. There are many spectacular vistas of Snowdon on this route, and the very beautiful Conwy Valley. The magnificent sweep of beach has a long row of Victorian properties with many seafront hotels offering lunches. The St Tudno at the west end of the bay in the shadow of the Great Orme is of particular note. Spend an hour ascending the Orme via the fenicular railway, and have a short walk to marvel the views to Snowdonia, the Lleyn Peninsula, the Isle of Anglesey and the medieval walled town of Conwy with its fine Norman castle. From Llandudno take the A546 via Deganwy, then across the river bridge to Conwy. This ancient walled town has some magnificent architecture including an original Elizabethan town manor house just off High Street that is well worth a visit. Edwards of Conwy’s shop is one of the finest butcher and delicatessens in Wales. Take a short walk through the town and along the walls and castle built by Edward I, and note Telford’s railway bridge that was designed to be in keeping with the architecture of the castle with it’s ramparts and towers. Then go to the quay where the smallest house in Britain is sandwiched among a row of fishermen’s cottages. The golf course at Conwy is an excellent links course, mostly on flat land that’s easy walking, but many of the holes are blind and very testing. The mussel fishery at Conwy is the last in Britain to harvest the molluscs using hand rakes and shallow flat bottomed boats. Conwy mussels are renowned for their fine flavour and plumpness from the rich nutrients of the estuary. The wide estuary of the River Conwy has thousands of acres of sea marsh that makes perfect summer grazing for lambs that acquire a very fine flavour from the lush marsh vegetation. The river itself has fine runs of salmon and sewin (sea trout). An early start in the day is needed for a day on the Lleyn Peninsula as its beauty unfolds for 30 miles all the way to the almost surrealist setting of the Isle of Bardsey, the most western point of North Wales. The walk along the sandy beach is very relaxing. Proceed on to Pwllheli, a town formerly only known for its Butlins holiday resort, but now boasts a fine marina, and many boutique shops, delicatessens and wine bars. 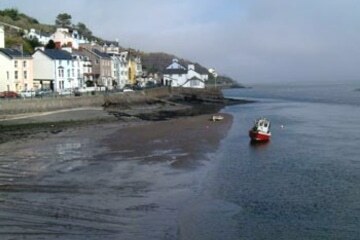 Abersoch is 7 miles further and is the home of the sailing fraternity and bustles throughout the summer months. Head west on the road to Uchmynydd which will lead to the end of the Peninsula and a large car park overlooking Bardsey Sound. 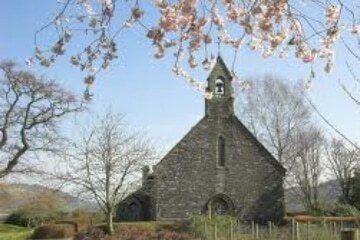 It was settled as far back as the 5th century, and in the middle ages the Isle was a refuge for persecuted Christians. It became known as the isle of 20,000 saints. The short three-mile crossing is through some of the most treacherous seas around Britain. For a shorter day on the Llyn, take the A497 from Pwllheli to Nefyn, a small town that was once a herring fishing village. The curing sheds still stand on the beach at Morfa Nefyn. The sandy bay is sheltered and safe for swimming. The golf course at Morfa Nefyn straddles the cliffs and has magnificent views and some very challenging holes. From Nefyn go to Trefor and follow signs to Nant Gwrtheryn. Note that the road is very steep in places and quite narrow. This small former granite quarrying village is now the centre for minor European languages. The walk along the pebble beach is truly invigorating. From the hotel head back towards Corwen, then turn left on the A5 and continue on this road for 45 miles to Menai Bridge. This road goes through Betws y Coed and Capel Curig, passing the deep blue Llyn Ogwen and the still working slate quarrying village of Bethesda. This takes in spectacular views of the Snowdonia Range with its lofty mountains, steep screes, cirques and snow capped peaks. Turn right on the A545 towards Beaumaris. Within half a mile the large lay by has a superb view of the famous suspension bridge over the Menai built by Telford in 1826 spanning the deep green churning waters below. 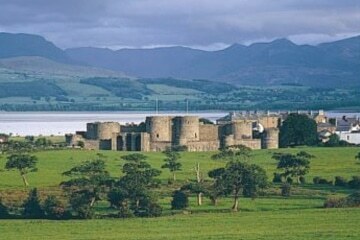 Visit Beaumaris and perhaps take a walk around the magnificent Norman castle, one of the finest examples of a Norman concentric castle to be found. Close by for lunch is Ye Olde Bull’s Head Brasserie or Neptunes restaurant that specialises in seafood. On a fine day it’s worth driving 7 miles to Red Wharf Bay. The drive north leads to the picturesque harbour of Amlwch, a town made prosperous from copper mining in the 19th century. Continue via the beautiful Bull Bay, Cemaes Bay back to the new A5 carriageway (this part of the drive is 30 miles), then south back to Menai Bridge (17 miles). Make time either to visit the sea zoo at Brynsiencyn or the National Trust property Plas Newydd where boat trips along the Menai take place in the season. Both are on the A4080 on the south west side of the Isle. For those interested in Neolithic remains opposite Plas Newydd is Bryn Celli Du, a burial chamber in amazingly good condition. Descend into the darkness under the turfed mound and stand alongside the great stone pillar that holds up the tomb. This is the same type of stone that was transported to Stonehenge during this era. On a fine day the three mile seep of golden sand of Llanddwyn Bay at Newborough is one of the best blue flag beaches to be found. Here swimming is safe at most times of the tide and the water is clear and fresh. In the centre of the Isle the twice weekly market at Llangefni is great fun when market stalls invade the area selling a wide range of food, household goods and bric-a-brac. The mountain railway goes from Porthmadog to Blaenau Ffestiniog, a former slate quarrying village. This makes a day out in itself, and the Cambrian Arms in Blaenau serves reasonable lunches. 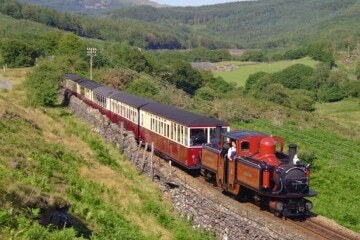 The views from the railway that leads up the winding valley passing Moelwyn Bach mountain are breath taking. 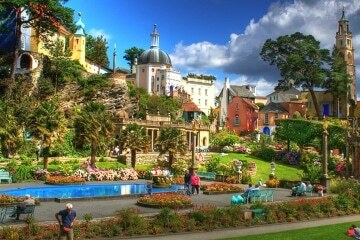 Another day in itself is to visit the fabulous Italianate village of Portmeirion. This was the work of Edwardian architect Clough Williams Ellis, who designed the village following inspiration from the Italian town of Portofino. 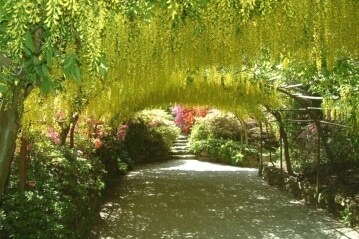 Follow the signs to Portmeirion at Minfford. The Hotel Portmeirion serves good food the spacious dining room is a superb setting for lunch. The views across the Treath Estuary are truly serene. There are plenty of walks in the village and lots to see with several shops and cafes. Take a walk from the hotel west to the mouth of the estuary. Do take care if walking on the sands as the sea comes in very rapidly flooding the area in minutes and currents can be treacherous. Swimming is not advised anywhere in the estuary. If you book lunch at the hotel it’s possible to take the car all the way if you advise the staff on the entrance to the village. Sign up for news of offers and events. Enter your email address*. * Note, your details will remain confidential to us and will not be disclosed to any third parties. Note, we will not automatically add your email to our mailing list. 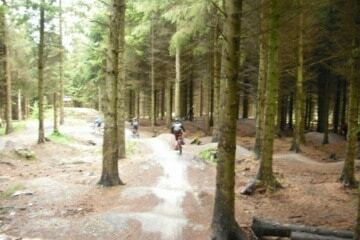 North Wales LL21 0ST. Tell us your dining or room queries, or whatever. Use the form, phone or email. © Copyright 2019: Tyddyn Llan. You can book dinner B and B, or just a room, or a table. Go to RESERVATIONS or phone 01490 440264.